Won't you share your passion? February through April, island fox pups will be born across the Channel Islands. Help give the 2018 pups the best chance of survival by supporting two important conservation projects. Pups on San Miguel Island face serious challenges like drought and climate change. Young foxes are struggling to survive and adults are threatened by new parasites. You can help National Park biologists better protect the foxes by donating toward a radio-tracking collar. Radio collars help biologists respond quickly when foxes are in danger. By refurbishing previously used collars, we're also reducing costs for foxes and the environment. Each refurbished collar costs $220, a 33% savings over typical radio collar costs and keeps a used collar out of landfills. 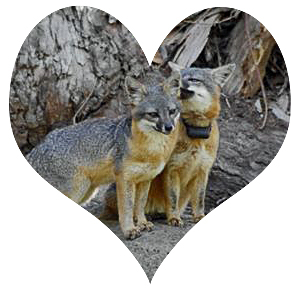 This Valentine's Day, FIF has our hearts set on funding 15 radio collars! 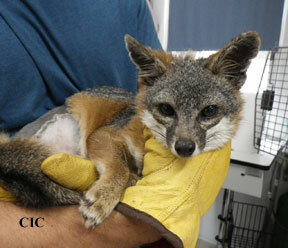 Island foxes on Catalina face another serious danger: automobiles. One of the ways to alert drivers to the dangers of speeding in fox territory is through electronic signs that tell drivers they are going too fast. These signs have been shown to slow down traffic and reduce fox injuries and death. A critical sign on Catalina needs replacing. For $3,000, we can repair the sign and put it back in service, saving more fox lives. 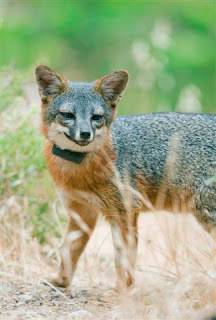 Help create a better future for island foxes!